All The ATV Info you need! As the name suggests, we deal with only ATVs, and all their related information (the 411). It's all about the quads, UTVs, four wheelers, and even the ATCs (for those diehard three wheeling guys). We can truly go anywhere on our quads, usually only limited by our nerves and experience level, and we come in numerous shapes and sizes, and we all have our favorite type of quad riding. And that is who this site is for, from the newbies to the seasoned veterans, and all levels in between. You will notice, if you hang around for a bit, that I "sign" every page with the phrase "Ride Safe. Ride Legal. Ride Again" and there are some really good reasons for that. the ATV Mantra - Ride Safe. Ride legal. Ride Again. The mantra for everyone who throws a leg over, and cracks the throttle. Whether you are a novice, intermediate, or advanced rider, safety has to come first. Ride Safe - I never ride my quad without my safety gear. Even if I am just riding my quad off of the trailer. A helmet and goggles are the absolute minimum gear you need to be wearing. Now I have been riding for what seems like forever, since I started on a dirt bike in the late 70's, and switched over to quads in the late 80's. So I never ride with just the minimum, I always have my riding pants, one of my long sleeved motocross jerseys ( I have about 10 to pick from now), gloves for a firm grip on the levers, and my motocross boots on whenever I ride. And whenever you ride solo, it seems that Trouble comes along for the ride, so always take a buddy with you! Ride Legal - Depending on where you live, there may tons of places to ride, or very few. So, it is critically important that you ride only where you are supposed to be riding. If you ride at a track or motocross park, stay in the designated areas. Blazing a trail of your own can upset anyone living nearby the facility. If you ride in a national park or forest, stay on the approved trails! Riding across a wide open meadow, or crossing a stream can upset the delicate balance of the ecosystem, and cause damage that lasts for quite some time. Also, riding legal means abiding by all of the applicable ATV laws. 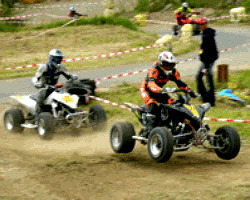 Before you ride, make sure that you have the proper registration, ORV license, and in some instances ATV insurance. Youth should never ride an adult sized ATV, until they reach the age of 16. Ride Again - By riding safely and legally, you increase the odds that you will continue to enjoy the great sport of ATVing for quite some time. Never ride beyond your skill level, never ride while under the influence (you can get ticketed or have your quad impounded, not to mention it's just plain stupid to do so), and never let kids ride unsupervised. Quads are now selling faster than dirt and street bikes combined (actually they have been for 20 years now! ), so we all need a place to get relevant, accurate, and trustworthy info about our sport. That is the purpose of the ATV-411.com website. Here you can get all of the information that they didn't put in your owner's manual. Do you prefer to carve through the forest, blazing down a trail? Ducking below the branches, and zipping in and out the trees that create a scenic, yet personal obstacle course for you and your machine. You may have ridden this trail before, but its different every time, creating a new memory to share. Or do you thrive on the thrill of just riding? Busting berms, whoops, and table tops. You could cruise the same patch of ground for hours, working on your skills and techniques. It takes practice, and hours in the saddle to move from novice to intermediate to expert. Could you be a desert rat? You thrill at seeing the nothing but a barren desert beckoning you to do battle. It's you against Mother Nature in this inhospitable environment. There is something special about riding the desert, the stillness, the quiet, the stark beauty that surrounds you everywhere. Are you the racer that so many of us dream to be? (me too!) It doesn't matter if you race hare scrambles, amateur, or pro class. You have taken your riding to the next level, and leave it all on the track, every lap. And if you have no trophies, or a hundred of them, you are an ATV rock star. And, if the the racers are the rockstars, the freestyle riders are on a different plane. Breaking the laws of gravity and physics, like it's no big deal. They have been born with more guts than anyone. Not everyone can even attempt a hundred foot jump, let alone pull it off, over and over again. Just awesome. or anything else you may want or need to know, just ask, we (I have a large group of riding buddies to ask) either know the answer, or we will find it. And of course, the rest of our pages can be seen in the Nav Bar to the left. Please feel free to "ride" around the site, and check everything out. As you can see, we will be covering a lot of ground, which is what quads do best! We will be constantly adding new things that you ask for. So, if you own or ride one of these machines, this is the place for you. How you choose to ride or use your four wheeler isn't important, since we welcome all riders and owners. There is a place here for all of our friends who use their quads for work, on the trail, through the woods, in the mud, on the sand, freestyle, or anything else. If it deals with quads, it is here, or is in the process of being added.